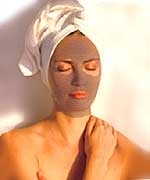 You can make your own Ghassoul mask by adding enough filtered water to 2 tbsp dry Ghassoul clay to make a thin paste. Apply to face and neck area and let sit for 15-20 minutes. This mask will harden. Rinse well with clear, warm water. For added benefit, especially to dry skin, add 1 tsp Palma Christi l'Originelle* to the paste. You will need a little less filtered water in this case and the mask will not harden. I look forward to your comments after trying this! *Palma Christi l'Originelle is suitable for all skin types and will not clog pores.